Boston Bruins center Sean Kuraly (52) skates over to the bench to celebrate his goal against the Toronto Maple Leafs during the second period of an NHL hockey game Saturday in Toronto. TORONTO — A pair of miscues proved costly for the Toronto Maple Leafs against the Boston Bruins. It’s only January, but it’s there’s a good chance the clubs could meet in a rematch of last spring’s playoff series that went the distance — a task Nazem Kadri said the Leafs would gladly welcome. “We’re always looking forward to playing these guys,” the center said. “They’re a great hockey team, they’re well-coached. Kuraly then intercepted Zaitsev’s soft pass behind the net before feeding Pastrnak, who buried his 26th past a surprised Hutchinson with 13.7 seconds left. Pastrnak, who took a puck off the cheek in warmup, now has 19 points (11 goals, eight assists) in 15 career regular-season games against Toronto — including six goals and three assists in four outings this season — after scoring five times and setting up eight against the Leafs in the 2018 playoffs. Boston’s top line of Pastrnak, Patrice Bergeron and Brad Marchand entered Saturday with a combined 117 points in 122 regular-season contests against Toronto. Auston Matthews, who has just one goal in his last nine games, had Rask down with four minutes to go, but the puck rolled off his stick on what would be Toronto’s best opportunity to tie. Boston led 1-0 after the first, but the Leafs got even at 7:37 of the second on a strange play. Johnsson’s quick shot went off Rask, off Bruins defenseman Kevan Miller and dribbled into the net for the winger’s 10th. Toronto’s dormant power play — 1 for 36 over its last 13 games when removing a 3-for-3 effort against Florida on Dec. 20 — came to life 1:53 later to give the Leafs their first lead when Marner blasted a slap shot past Rask on the short side. 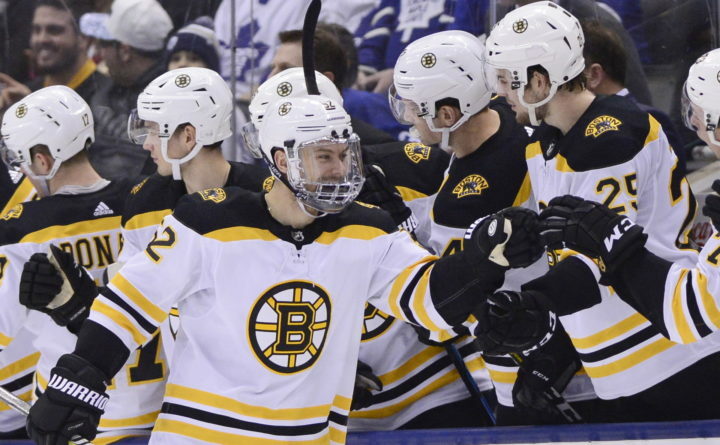 Hutchinson, who spent three seasons in the minors with the Bruins after getting drafted 77th overall by Boston in 2008, got his fifth straight start for Toronto with No. 1 netminder Frederik Andersen — sidelined since Dec. 28 with a groin injury — out with the flu and backup Garret Sparks still recovering from a concussion. Rask, who improved to 5-0-0 with a .955 save percentage and a 1.28 goals-against average in his past five starts, then stopped Kadri on a wraparound before Zach Hyman’s deflection went just wide. Kasperi Kapanen had another great chance for Toronto prior to Krejci’s opener, but Bruins defenseman Matt Grzelcyk blocked his effort.